every mama deserves a minute. breathe. rest. find joy in the journey. Mom, how can you love me even when I’m bad? This question came out of the blue from the boy buckled in his car seat while we were headed down the road. My inquisitive four and a half year old catches me off guard with deep questions quite often. And this was another question I wanted to be sure I answered correctly. My boy is like a walking encyclopedia. I quickly asked God for wisdom and shared what we studied in our small group the night before. Grace. That seemed to satisfy him. Phew. Off the hook until the next question! But as he stared out the window I couldn’t shake that question for my own life. How can God, my Heavenly Father, love me with all of my mess? It made me so unbelievably grateful that God loves us so much. Even in our sinful ways, He sent His son to die for us so that we can have life and have it abundantly. That we can have freedom. That we can have a relationship with the most perfect God. He wants us to connect with Him no matter how bad we’ve messed up. He’s reaching out His hand to help us stand again, fill us with His power, and praise Him for all He’s done in our life. How amazing is that? That’s good news, friends. Like really good! At times this world can feel so negative, so hard, like a battle we can never win. And the truth is we can’t win alone. We need Him. How can He love me even when I am bad? Grace. That’s how. He gives us grace. Unending grace. And for that I am thankful. I've always loved silhouettes. They are just full of charm and true history. I remember seeing my friend Sarah's in her home and knew one day I would love to create some of my own. There are so many ways out there to create a silhouette, but I decided to try the easiest route to see if it would look good. And I love it! I am sharing a little DIY tutorial after a few friends have requested one. 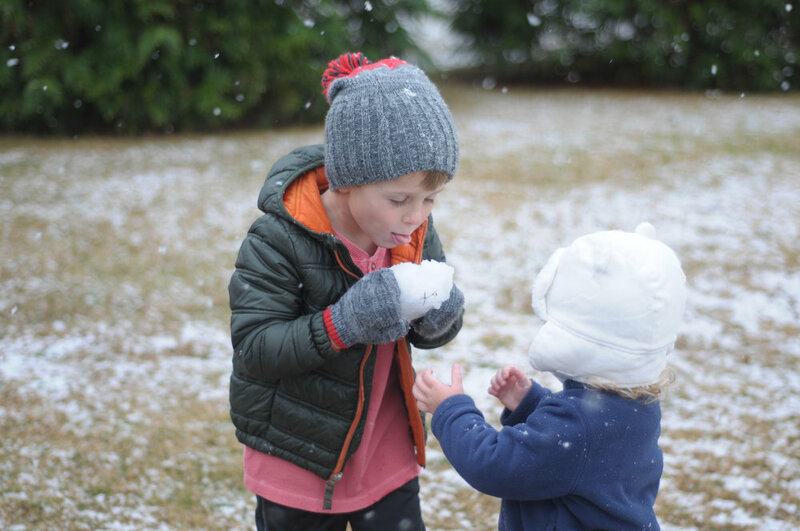 First, get your kiddos photo ready. Sort of. 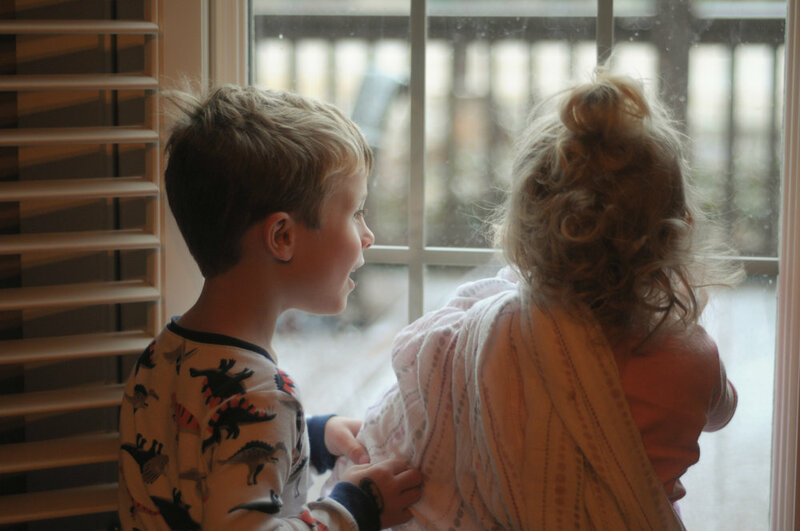 Mine were still in their pjs, but I made sure to fix their hair the way I wanted it in the silhouette. With girls, you can add a bow for fun, or style their hair in different ways to see what you like the most. Second, find a blank wall with no distractions. Third, you can use your phone for the photo or use your regular camera. I used my DSLR, but it really doesn't matter. Have children stand next to the wall (not touching) and have them look straight in front of them so you get a good side angle. I wanted their nose and lips to show in the profile photo for sure. 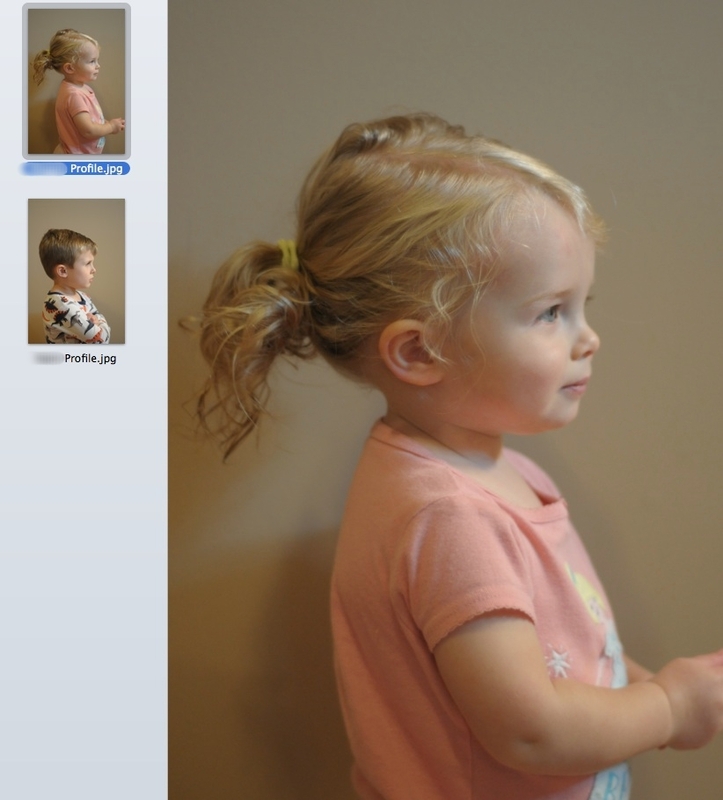 Take the photo from the same distance and have them stand in the same spot if you are doing this for multiple children. This will help their heads be correct in size comparison. 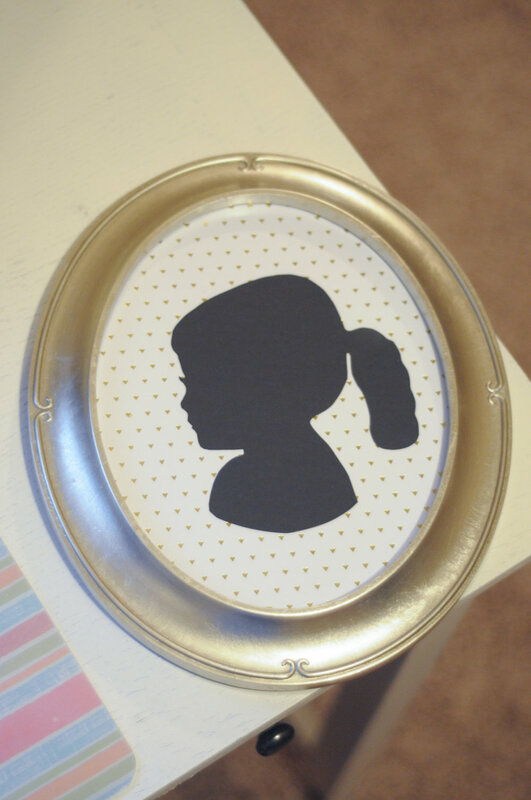 For example my 22 month old is going to have a tinier silhouette than my 4 year old. You can also correct this in the print menu by changing the scale. My boy is such a ham! Next, print your photo. I printed mine in black and white to show more contrast. The magic is in this step. Here's where you can add in some drama like eyelashes or shape up their hair. On both of my kiddos I added their eyelashes and had to define Maggie's hair because of a few curls that needed to be tamed for the silhouette. After highlighting your silhouette, carefully cut around the photo. 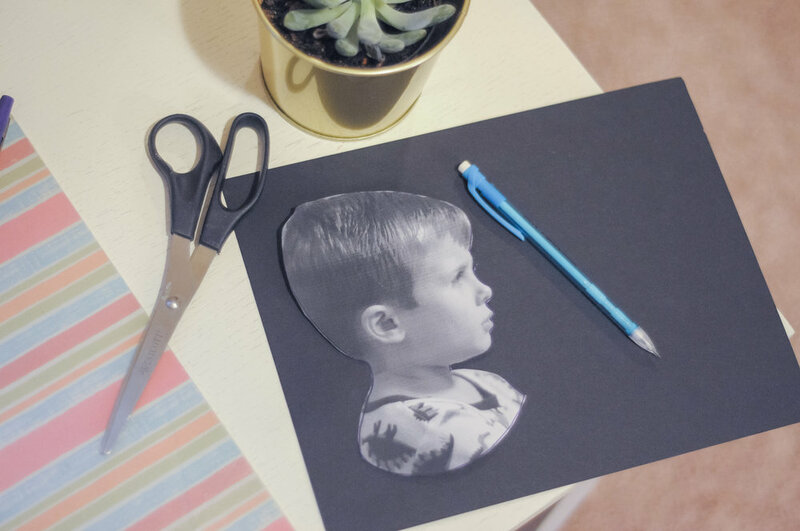 Now that you have your pattern, trace their silhouette in pencil on a black piece of card-stock, and cut it out very carefully to get their sweet nose, lips, and precious facial features exactly as they are. 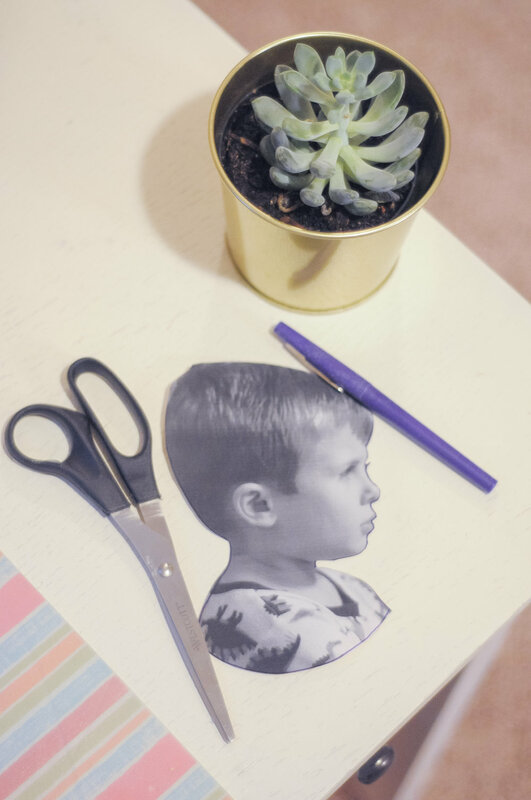 Once you cut out the silhouette, you can erase any pencil marks or you can simply flip the silhouette over. 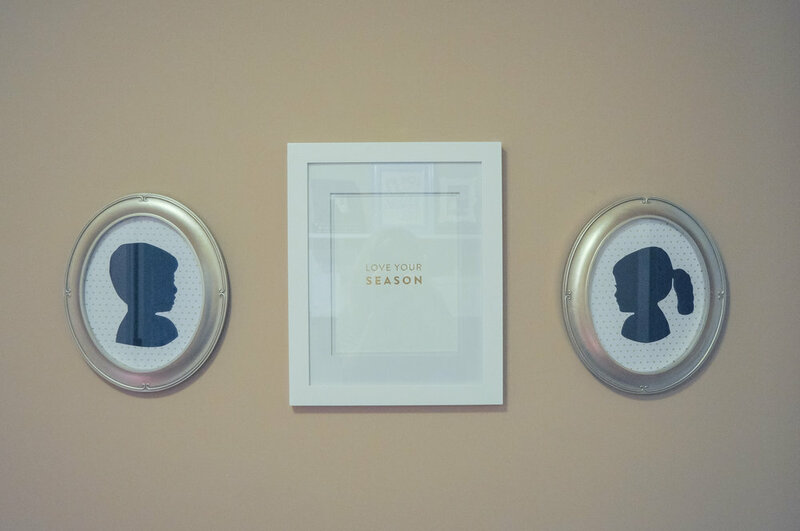 Last, I mounted the silhouette on a piece of scrapbook paper with a glue stick and framed it. I was matching a print that I was framing to hang with the silhouettes so I went with gold hearts on scrapbook paper from my local Hobby Lobby. You can also use fabric for the background instead of scrapbook paper. This would be cute if you were hanging it in your child's bedroom and used coordinating fabric that compliments their curtains or bedding. I bought a sweet print from Emily Ley's shop and framed it in a simple 11x14 frame from Michaels. I felt like the silhouettes looked perfect next to the print. The 8x10 frames that I placed the silhouettes in were 50% off at Hobby Lobby. The price for each silhouette was around $12. Wouldn't they make the cutest addition to your house or a gift for grandparents? Tag me @mamasminute or #mamasminute when you create your own! We had a strange Saturday. First of all, we had nothing written on the calendar to do. 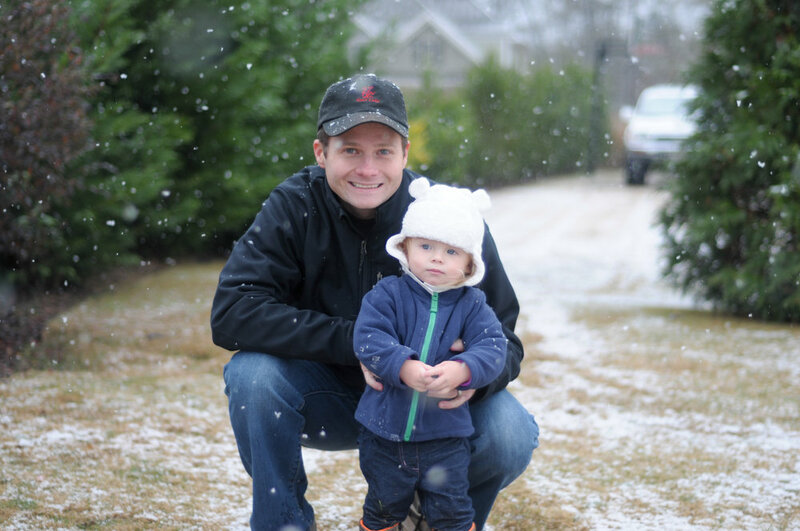 That NEVER happens, but I have been trying to minimize how much I plan for our family. This season can be non-stop if we don't plan time in to relax. I woke up and was hanging in the living room with the kiddos. 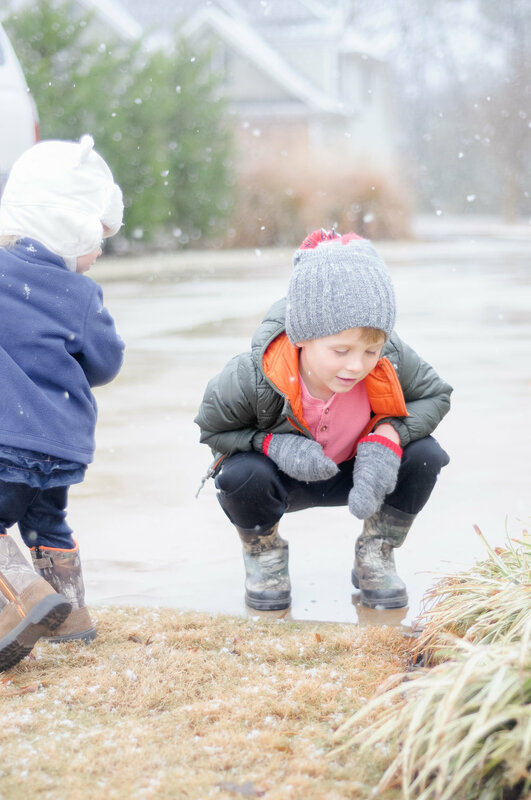 The weather report was calling for snow in GA, but while the top half of GA was looking like a winter wonderland, our little neck of the woods was getting some more rain. Ryan walked out of our bedroom and told me his mother just called with the news his Nana had passed. She had been sick for some time this year, but it still was a shock at how fast she went to Heaven. About 15 minutes later I peeked out the window and the rain had turned to snow. It was gorgeous and so peaceful. 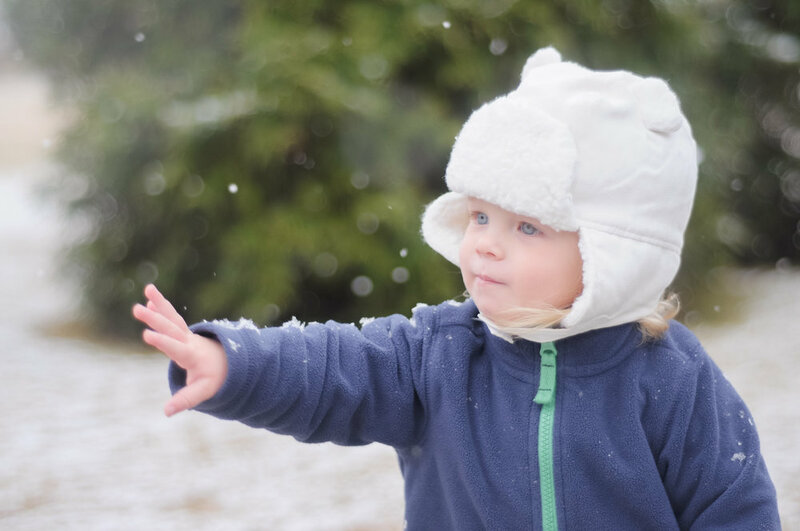 V was so excited to watch it begin sticking to the ground and get on his coat and boots to play. M wasn't so sure why the rain looked so different and was amazed. So, while the day wasn't what we expected it was what we had planned. Spending time with one another and thanking God for our blessing of family. PLANNER talk! I’m a major planner by nature, but finding a paper planner that I LOVE has always been a struggle...until Passion Planner. I bought my first one 4 years ago and it was fabulous. Now, they are even better! And I can hook you up with a code (DDOSS10) that saves you 10%! So go now and grab one for 2018! It will be here before you know it. The other day, my husband and I were at a red light at an intersection. I noticed the lady in the car next to us was waving at me. I rolled down my window and in broken english she asked "how do I get to 78?" Normally, I am horrible at directions, but this time I was confident in my reply. I told her to go a few more miles on this road and she would see the signs for 78, and an exit on her right. She thanked me and rolled up her window as the light turned green and we both were on our way. As we were nearing our road that was a bit before the signs for 78, she started to slow down. When we turned, I couldn't help but say aloud "keep going, you're almost there!" And then it occurred to me, how many times do we doubt the path we are on? We wonder if we are close to the end of the suffering or close to a victory. How much more must we endure, how many more prayers do we need to pray, or how many times will we beg God for an answer? We often say, "If God would just show me a little bit about where I am supposed to be - let me see a glimpse of His plan", but that's not how He works. The driver couldn't see ahead to know that her victory to make it to her destination was literally seconds away. With no map to go by, she had to trust that what I told her was the truth. The same goes for us while we go through life and encounter good and bad times. We can't see God and his incredible army of angels protecting and guiding us along. But we have His word to trust for direction and hope. Are you right in the middle of a hardship or struggle right now? Are you wondering if you are doing this mom-thing the right way or do you need to make an important financial decision? You could be trying to figure out what is best for your family, dealing with sickness, or maybe a hard time in your marriage. Whatever it is, God's word is here to give you hope, direction, guidance and keep you going on the right road. In Romans 5:3-4 we read about peace and hope as it says " Not only so, but we also glory in our sufferings, because we know that suffering produces perseverance; perseverance, character; and character, hope." So mama, here's your reminder to persevere today because of the hope God gives us. Know that He is cheering us on our journey through the valleys and victories.